Hi I’m Cari, I’ve written a review of Little Voice for my Bronze Arts Award Project where I was required to view a performance, write a review, give and share my opinion. This is my first time writing on a blog and I thought it would be a good way of sharing my review. I’d love to hear your comments and feedback. Thanks. Witty, intelligent and insightful, Little Voice has it all. Set in a gritty working class family, where poverty and desperation appear round every turn. The Rise and Fall of Little Voice lit up an unseen spark which remained untouched throughout the play. Little Voice (LV) spends her time in her room, relentlessly playing her dead father’s cherished record collection, in a house which she shares with her mother, Mari. Mari is loud, crude and frequently drinks. This automatically sets an interesting starting point, as LV is the opposite to her mother, and drowns out the emptiness she feels with the sound of her music. The play commences with Mari getting a new phone fitted into her house. I feel this was an excellent starting point, as it immediately sets the time concept and shows the awkward relationship between Mari and LV. LV’s soon to be friend Billy is also introduced in this scene. There tentative yet intimate relationship slowly blossoms throughout the play, and captivates the audience because of their unlikely friendship. 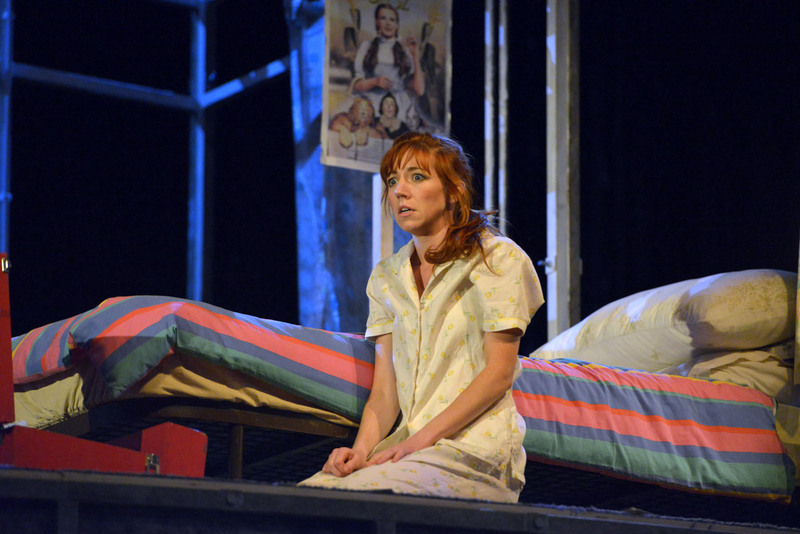 Nancy Sullivan (LV) was perfectly cast in this role, as she captures the shyness and timidness of LV, as well as the spark and desire to be heard. Later in the show, we realise that not only does LV listen to music, she can also flawlessly impersonate the famous artists. This is revealed when she sings to herself and her mother’s latest fling Ray Say. Astonished and bewildered, Ray Say acts upon this and attempts to persuade LV to sing in the local cabaret. The entirety of the play is then based upon LV mastering the courage to perform and make her father proud. Nancy Sullivan’s beautiful singing bewitches the audience and transports you to Hollywood: a thought, I presume, that’s also on Mari’s and Ray Say’s mind. Vicky Entwhistle complements Mari to a T. She is a Yorkshire lass who’s larger than life and feels misplaced in the life she is living. Her constant boozy barrier, protects her from the looming fears of poverty and isolation which is perfectly shown by her acting. The transition from scene to scene is snippets of radio broadcast from the time; such as, Margaret Thatcher and the Miners Strike. I feel this highlighted the struggles in that time period and related well to LV and Mari’s struggle in a working class life. It was also well chosen, as it has an effect on audience members who lived through that time period, as well as the Tories unmistakeable effect on the social and economic structure then and now. The set reflected a Yorkshire terrace house, it has a damaged structure and is falling apart in various places. It contains two bedrooms, a bathroom and adjoined living and kitchen space. Around the outside of the house were various objects, such as dart boards and broken junk. I feel this may represent past memories of LV’s father and Mari’s old life as a constant reminder of what they don’t have. The fractured house structure may also reflect LV and her mother’s fractured relationship. To conclude, The Rise and Fall of Little Voice is a witty unmissable play currently showing at the West Yorkshire Playhouse. It touches on life as a working class family in the time of the Tories reign in the 1980’s. James Brining and Jim Cartwright have created a touching performance that makes us think about how our starting point in life affects us and how success is finding who you really are. I make no apologies that at the moment this blog is having it’s fair share of bike related posts because as well as my riding and the Tour hitting town in a little over a week’s time there are literally stacks of art and cultural bike related events happening using the tour as a catalyst – there are 48 events in Leeds over the next week alone. Alongside the headline Yorkshire Festival stuff there are all sorts of other smaller events taking place. This is never going to happen again here so I’m determined to make the most of it. Tonight I went along to Bike Story by 509Arts which was an outside show featuring bike stories, our bike stories. People have been submitting their memories and stories and these were then brought to life by the three actors into a one hour show of history, nostalgia, memories and humour celebrating how bikes have been intertwined in our lives even if you may now no longer ride one. Most of us can remember learning to ride a bike, those first wobbly moments of freedom with parent or older sibling puffing along beside you encouraging you to keep pedalling while you shouted at them to keep holding on. This heartfelt moment was of course replayed beautifully but there were many others, from an aid worker borrowing a local kids bike to set a strava king of the mountain time in a war zone, a lonely single man riding around on his tandem after a breakup of his relationship which had initial started after their bikes had been locked to each others, someone who’d lost 16 stone through cycling and wondered if he could ride 100 miles to his girlfriends house, the first British man to complete the Tour de France, bumps and scrapes, a fatality, charging down hills and puffing up them, Christmas presents, Birthday presents, hand me downs were all played out as a revolving patchwork of bikes and memories. These stories were intertwined with our own which we’d been asked to scribble down and hand in before the show started and I found myself transported back to my early wobbles as one of the older kids in the village had been tasked with getting me riding for ‘Bob a Job Week’ . I feel very fortunate in that as I cycle most days I’m constantly refreshing the memory bank with new stories some of which, like Monday’s ride, link me straight back through time to my younger self. All that life is was on display tonight, our hopes and dreams, fears and failures, loves and losses but all told with heartfelt whimsy from the saddle and the moral of the bike story – just keep pedalling. Photos from far and wide- April 14. Following my photos in January and it’s great success I enlisted the help of 9 others to join up for an April version of the same thing. Now before you think this is a group of people who all live in Leeds, you are mistaken, these photos come far and wide and have winged their way locally from Leeds, Sheffield, Chester, and Llandinum (its in Wales before you ask!). I have had great fun collating all the pictures and seeing how people have interpretated the project, and one of the things that sticks out to me is my connection that I have to all the people. The mix of people involved include friends from twitter, neighbours, bestest chums, a friends sisters as well as a few of my family members. The photos show imagination, excitement, fun and great colour and to me illustrate the commonality I have with all the people involved despite some of us being 100s of miles apart. Unsurprisingly there have been similar images of gardening, craft, cooking, food, the outdoors and architecture and all stand out as things that bring you all together through me. Whilst gathering the images I asked for some feedback from people, the comments overall highlight that its been enjoyable, and has mainly enabled people to consider positive things and fun activities they have been doing. Below are some of their thoughts…. “Surprisingly I never forgot to take a photo. Unsurprisingly they seem to reflect a busy life”. Hope you enjoy looking at the photos, and thank you to everyone involved. 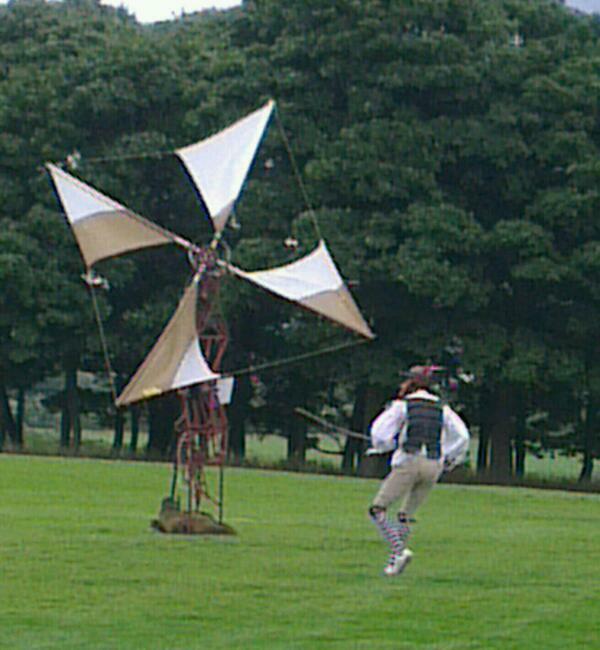 Sunday afternoon saw me head off to see La Mancha recreated in Leeds with the retelling of the Don Quixote story by theatre group Burn the Curtain. This promised to be a somewhat different affair however as it was going to be done by bike and we the audience would be a moving audience also travelling by bike who would also potentially be part of the show. 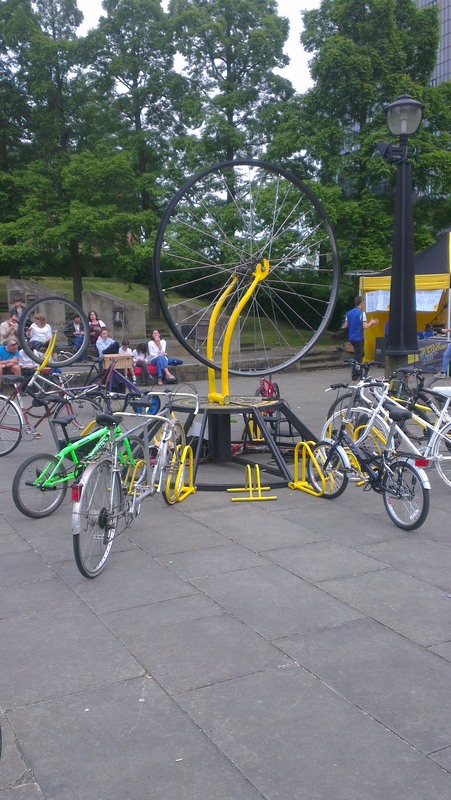 Sounded likes a bonkers proposition to me but well worth exploring and a great finish to the work that East Street Arts have been doing to get the conept of Leeds Bike Fest off the ground by showcasing different arts events centred around the bike. However before I could recreate some 17th century literature I delved into the word of JG Ballard and his nightmare visions of urban Britain as I attempted to cycle over to Temple Newsom Park through the industrial outskirts of South Leeds, criss crossing huge arterial routes into the city. I was trying to follow blue bike signs but it proved to be a very haphazard arrangement and I would not have been able to find my way through the maze without stopping and using my phone. My experience of this was that while it was great that some attempt has been made at a ‘bike route’ a lot more needs to be done to make it viable and attractive. Once at the Park though things took an interesting twist as I signed on, was asked to come up with a name for myself and then directed to a tent to make a horses head that would convert my bike into a horseycle before being greeted by the Duke and Duchess, who’s party we were due to attend, who arrived on the most spectacular tall bikes it’s possible to imagine. I knew at this point if I hadn’t already guessed it that this was going to be a few hours of spectacular surrealness and fun. Don Quixote then arrived and along with his faithful servant Sancho Panza we mounted our steeds and headed off to the castle/ inn accompanied to the Taking Heads Road to Knowhere that was blasting out of a bike drawn speaker system that accompanied us on our travels. In the original book Don Quixote mistakes an Inn for a Castle and becomes such a nuisance in his desire to be knighted that the landlady eventually agrees to knight him. As we re-enacted this while a group of cyclists formed the cayote gang and played a game of shark (don’t ask) the love of Don Quixote’s life (not that she knows this) Dulcinea sails past on another incredible machine, a vision in white with huge streamers billowing out behind her. As she vanishes Don Quixote decides to go on an adventure to find Dulcinea and we ride off into the woods. In the book Don Quixote’s niece is concerned about her uncles’ delusions of grandeur and tales of knights and chivalry that he has read about in books that she decides to burn all his books about such things. At this point another incredible bike rides past pillowing smoke from a wood burning stove, we give chase only to find the niece indeed burning the books! We don’t needs books though we can create our own adventures and set off again, avoiding dangers, dragons, wizards while freeing trapped prisoners (whether or not they should have been freed) before riding to the moon and back. All of this of course being told as we rode around the woods on our horseycles accompanying the incredible energy and spirit of adventure of Don Quixote. Don Quixote finally comes to slay the giant which of course is only a windmill as his servant points out to him but ignoring him Don Quixote tilts away determined to defeat the giant until he realises the futility of his actions. Feeling downheartened a final dual awaits against the knight of mirrors but that too ends in defeat. Defeated and feeling the fool Don Quixote departs the scene only to finally be united with Dulcinea while we are left to ponder the plight of Don Quixote and his adventures. It was a hugely enjoyable afternoon and unlike anything I’ve ever done before, the breadth and scope of trying to convert what is often regarded as the birthplace of modern literature into an inclusive audience participation piece, on bikes across several miles of park and woodland was pretty staggering. Even if you knew the rough original story, and there was no need that you had to, you had no idea what was coming next or how the adventure would unfold. Overall it was a tremendous mix of farce and philosophy and is perhaps the closest I’ll ever get to taking part in a Monty Python sketch. Goodness only knows what the various dog walkers, family outings etc thought as 20 odd horsecyles, tall bikes, trikes and other assorted bikes and characters cavorted across the park. What of course to make of our noble knight? was he a bumbling fool who abjectly failed in his quests? Maybe so but perhaps he has enduring lessons to teach us all, do not fear failure but fear trying, wanting to act in a noble and chivalrous fashion is perhaps not to be sniffed at, saddle your noble steed and seek adventure and let your (bike) chain set you free. Thursday on reflection turned out to be a day of memories revisited as after my fun at the media museum in the afternoon playing Galaxian the evening saw me head down the West Yorkshire Playhouse for the annual visit to the Christmas production, which this year was Wind in the Willows. It’s very much become a tradition now for us to go to the Christmas show and we have all been thoroughly entertained with some brilliant performances over the last few years. I’m not much of a theatre goer but must admit that every time I do go there is an immediacy to it which I really enjoy and I must make more of an effort to investigate what’s going on. I think that the Christmas show holds a special magic however in that it normally takes a book or film that we remember experiencing as children, and have no doubt passed on to our own children, and transforming what we therefore know and love into a magically stage experience. I’m always interested in the different classics that are chosen and find it particularly interesting when, as this year, they are bringing a book to the stage rather than a musical film such as Annie or the Wizard of Oz. The main theatre at the playhouse also holds a special memory for us as a few years ago when the Wizard of Oz was on I and some friends managed to bump into the Wicked Witch in a bar. She kindly met us and our families the next day when we were due to attend and gave us a tour of all the costumes and behind the scenes sets and much to the kids delight let them stand on the revolving stage. It made a huge impression and really added something to be sitting in the audience a few hours later watching the performance. We all still remember this and are always looking at how the stage now works, the sets, the costumes, how many different parts each of the actors or actresses might be playing – things that we perhaps would not have known about had we not been given a bit of inside knowledge by that actress. The current production of Wind in the Willows has been adapted for stage from Kenneth Grahame’s classic novel by Alan Bennett so I was fairly sure the dialogue was going to be crisp and funny and we were not disappointed but the characters and costumes were simply fantastic. We all actually had different favourites but mine I think was Ratty who was brought into raffish life by Jack Lord. I was surprised at first by there being no orchestra pit but soon realised why as most of the characters actually play various instruments throughout the performance which, allied with the amazing movement and choreography throughout, supported the script beautifully. I did at one point think that things were perhaps moving a little slowly but then reminded myself that that is how things are down by the riverbank pootling along and watching the world go by. Overall it was a highly original and entertaining performance that thoroughly brought the book to life and was a delight to behold enchanting young and old alike and surely that is what Christmas should be about. The performance runs till January 19 so if you have not been along I’d thoroughly recommend it, what a good start it would be to the New Year. 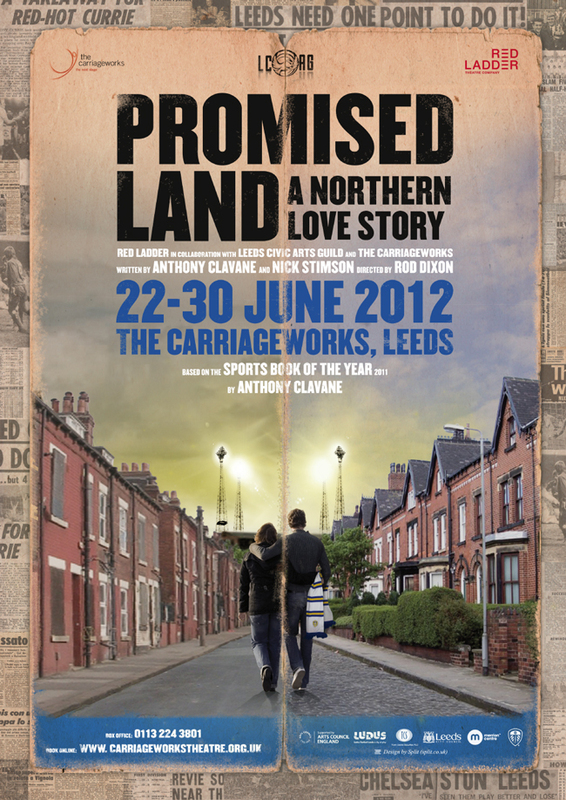 The Promised land is a fantastic book by Anthony Clavane plotting the rise and fall of his beloved hometown team Leeds United set against the backdrop of the rise and rise of on of the powerhouse cities of the industrial revolution, Leeds. Clavane is also Jewish and the way he weaves the history of Leeds’ Jewish population (once the largest outside of London) into the rich history of the city and its love hate relationship with its football team. I was fascinated then to see how it would be translated on to a the stage. Billed as a Northern Love Story, the documentary style of the book had to be fundamentally translated into a narrative that could be told in a theatre and I have to say I thought it was a huge success. The production was by local amateur company Red Ladder and full credit to the company: this was a production of professional standards from the staging, design, direction and acting. It was a touching, thrilling and at times uncomfortable experience as the starstruck lovers at the centre of the story played out their awkward North Leeds Jewish and South Leeds Beeston relationship against a backdrop of racism, hooliganism and dead-end opportunity of Leeds in 1975. The book told the fascinating story of immigrant jews in Leeds and how they came to dominate the city’s sporting clubs, first with Rugby League and latterly Football – this was very well handled in the stage production using the descendants of the central couple to tell this revealing story. The title of the post by the way came from the programme notes for the production written by Anthony Clavan and I really quite liked it. He talks a lot about the “Leeds Attitude” that permeates the city – we’re used to being hated (particularly in the context of LUFC) and as such we’ve developed our own coping mechanism, a kind of ‘us against the world’ approach. This phrase kind of summed up my own personal love hate relationship with the city which over the years has provided me personally with a wealth of opportunities (and I am blessed) but also can frustratingly hold us back with a lack of vision and old-fashioned parochialism. But having said that I still live here and I like to think that in doing so, I’m playing my own small part in The Promised Land. I am essentially a big kid at heart and of course having kids of my own enables me to indulge my inner child quite frequently, none more so than watching children’s films and TV – much of which is far too intelligent and humourous to be left to the kids. A case in point must be the brilliant Horrible Histories series tucked away on children’s BBC which is surely one of the best sketch shows on TV – Blackadder for kids is the closest description I can get. The TV series is based on the phenomenally successful books by Terry Deary which took a factual look at historical periods and events and packed them full of what actually happened so there is death, blood, disease, famine etc etc. In doing so Deary created a fantastic winning formula that has got kids hooked on history through his tales of the Vicious Vikings, Terrible Tudors etc. While the books are great fun it is the TV series that really hits the spot with brilliant sketch after brilliant sketch and of course the horrible history songs. My kids have learnt so much about history through this medium and can happily sing the outcome of all of Henry VIII’s wives. As well as the one off sketches and songs on particular themes there are recurring sketches, my fav being the stupid deaths sketch where people queue up before the grim reaper explaining what happened to them. So if you’ve got kids then no doubt you will be well aware of the genius of this show, if you haven’t then watch it and see how it puts most of the current crop of sketch shows and comedians to shame.